In his obituary, his family describes 33-year-old Elliott Duke of Lebanon as a “child at heart.” Maybe that helps explain why he was hit by a car while walking in the Highway 20 traffic lanes before dawn back in July and why his life was cut short when he rode his bike in front of a train in Albany on Dec. 7. In July he was seriously hurt when a sheriff’s deputy, responding to reports of a darkly-dressed pedestrian on Highway 20 at half past 3 a.m., accidentally hit him in the middle of the eastbound lanes near Lebanon. On Monday, Albany police say, he was on a mountain bike, headed west on Queen Avenue, when witnesses saw him going around the closed crossing gate, getting hit by the train and being thrown clear. Capt. Eric Carter told me that according to the report of the first responders, the train was going about 36 miles an hour, though the report failed to say in which direction. A witness could see the train coming and did not understand why anyone would attempt to get across the tracks. 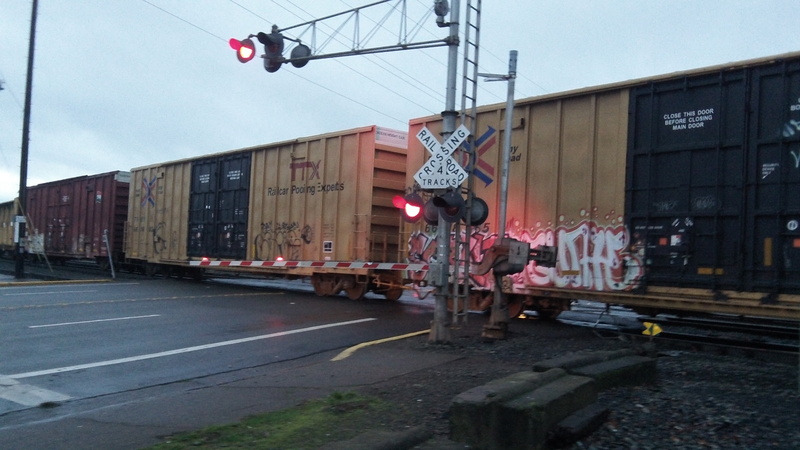 The report in front of Carter when I talked to him didn’t say whether Duke was wearing ear buds that might have kept him from hearing the approaching train or the warning bells at the crossing. But clearly he had to have seen the closed gate in order to go around it. Carter says no one will ever know whether the young man didn’t see the train or saw it and thought he could beat it across the tracks. As the local paper pointed out, someone else, also on a bike, was killed at the Queen Avenue crossing last year after also ignoring a down gate, though the circumstances might have been different in other ways. Crossing protection in action during a switching operation at the Queen Avenue crossing.